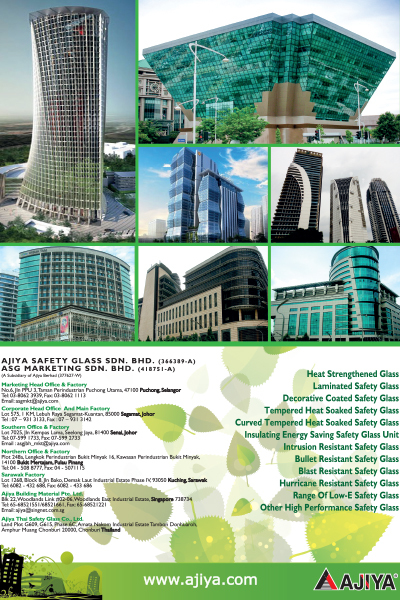 Ajiya Tempered Glass, Ajiya Heat Strengthened Glass, Ajiya Laminated Glass, Ajiya Insulating Glass, Ajiya Decorative Coated Glass, Ajiya Insulating Resistant Glass, Ajiya Bullet Resistant Glass, Ajiya Blast Resistant Glass, Ajiya Hurricane Resistant Glass, Ajiya Low E-Class and Other High Performance Glass. We are a subsidiary of Ajiya Berhad, formed in November 1995. Our principal activities are in the manufacturing of heat strengthened glass, tempered glass, insulating glass, laminated glass, decorative coated glass, security glass and other high quality products. With modern production facilities, well trained personnel and a dynamic management team. Ajiya is committed to provide high quality glazing products, continuous innovation and outstanding service. Ajiya endeavors to be the best supplier of glass products and be the leader in the market in which it competes.